HTC HD3 Specs And Pics: Really? I have no idea whether this is the real thing or a very clever photoshopped mock-up - but if wishing were enough, I want this to be real! 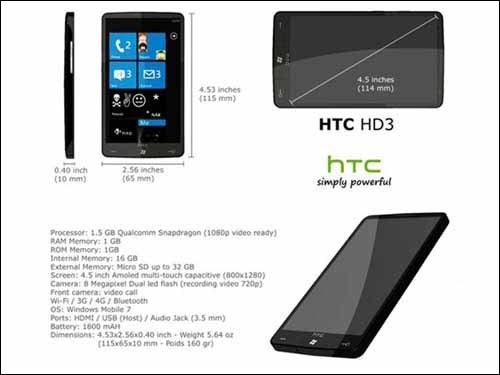 The specs are to die for, and if WP7 holds up its end of the bargain, then this will be the one of the hottest handsets for the 2010 holiday season. Check these out: 1.5GHz Snapdragon processor, 16GB storage, 4.5" AMOLED screen at the insane resolution of 1280x800, and an 8MP camera with 720p video recording. On the other hand, the spec sheet has typos and errors ("1.5 GB Qualcomm", "Windows Mobile 7", and what the heck does it mean by 4G? ), which aren't exactly confidence inspiring, and neither is the photo with the screen shot. You can check out the original (translated) pconline article via the link. Opinions, gentlemen and ladies? Ugh, yeah it's a fake. WMExperts has the lowdown. Still, HTC could do worse than to release this design. Fake. WP7 doesnt support that resolution. Yeah, exactly. The first Windows Phone 7 devices will be 800 x 480, nothing more, nothing else. The other specs are plausible, but ultimately this is fake because of the resolution. I don't see why it wouldn't support the higher resolution but, correct me if I'm wrong, I think Microsoft has said WinPho7 won't support card slots. That means this can't be a WinPho 7 device, at least not as listed. Darn, and here I was hoping somebody would challenge Apple's "retina" display. While Windows Phone 7 might technically support higher than 800 x 480 resolutions, that's absolutely the hard-coded spec for chassis 1 devices - and NOTHING else is allowed. They'd have to go up to 1600 x 920 in order to maintain application compatibility (resolution doubling, which is exactly why Apple did the resolution they did). When will we see a 1600 x 920 screen? Talk to me in 2016. How about the MicroSD...I thought that isn't allowed in WinPho7 devices? Even if this device is true, when does screen size become too big for a smartphone? Isn't 4.5" a little overkill? IMHO HD2 display of 4.3" is already pushing limits. Dell Streak with 5" screen is more in UMPC category. I think 4" display for a smartphone is a perfect size, anything above that would be too much. A device that you carry with you all the time should have manageable dominions after all. What do you think? Good point. I agree the Streak seems like too much. I don't know though...how much extra can they get if they take the screen to the edge instead of having a border around it? Some phones have a lot of wasted real estate around the screen.